Miracle Product Reverses Sun Damage? Every beauty blogger worth her salt will tell you that it's not possible to reverse the effects of sun damage. Once that skin has been exposed to UV without protection, it's only a matter of time before the damage starts to show on the surface of the skin in the form of pigmentation, wrinkles, and uneven skin tone and texture. However, advancements in technology and skincare research have now shown that for the first time ever, it may be possible to reverse that damage, instead of just trying to reduce it. This new revolutionary and lab-tested and proven skincare is called DNA repair lotion. These DNA repair lotions prevent skin precancer, help you avoid brown spots from sun damage, and even prohibits the production of collagenese (which prevents the development of collagen). What's more, these new serums are effective in as little as an hour from the time of application. A product now available in Malaysia utilises this exact technology, and I am so excited to share the review of this product with you guys today. 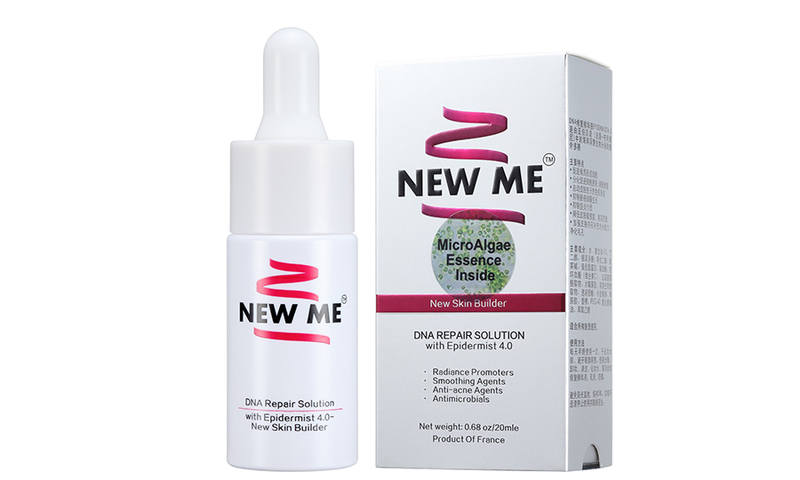 This product is the New Me DNA Repair Solution. This serum is aimed at repairing and smoothing the skin, preventing ageing, and prevents the forming of acne. It is a lightweight, clear liquid serum that absorbs quickly into the skin. You get only 20ml of the stuff, but that does last a long time as you only need 2-3 drops per application. This is a largely Asian product, so there is not much information available about it online, and it's sold via a local reseller who operates via Whatsapp (+60173252390) and Facebook. Honestly, the packaging didn't really wow me very much, the product is housed in an unassuming, plain white bottle, with the New Me brand printed on the front. I am, however, very happy with the dropper bottle as it's always good to prioritise hygiene when it comes to skincare. Now, bear in mind that I haven't been using this very long (just 1 1/2 weeks), so I'm going to be reviewing this product based on my experience. I have started to see a reduction in the pigmentation of my acne scars, and my skin always feels smooth and glowing in the morning after I applied the serum the night before. What impresses me is the fact that in as little as 5 days, there was already a reduction in the visibility of my acne scars. That's very quick, and very surprising. Now that it's been 1 1/2 weeks, the scars have faded even more, though they're not completely gone yet (you can check my Snapchats for snaps with no makeup and see the scars for yourself). This product is very promising, and with its use of this advancement in skincare, I think it's safe to say that the anti-ageing benefits of this serum will be quite effective as well. This serum retails for RM95 per bottle, with a current promo where you receive 1 bottle for free upon purchasing 3 bottles.